Medical cannabis, or medical marijuana, can refer to the use of cannabis and its cannabinoids to treat disease or improve symptoms; however, there is no single agreed-upon definition. The rigorous scientific study of cannabis as a medicine has been hampered by production restrictions and other federal regulations. There is limited evidence suggesting cannabis can be used to reduce nausea and vomiting during chemotherapy, to improve appetite in people with HIV/AIDS, and to treat chronic pain and muscle spasms. Its use for other medical applications is insufficient for conclusions about safety or efficacy. Some immediate undesired side effects include a decrease in short-term memory, dry mouth, impaired motor skills and reddening of the eyes. Aside from a subjective change in perception and mood, the most common short-term physical and neurological effects include increased heart rate, increased appetite and consumption of food, lowered blood pressure, impairment of short-term and working memory,   psychomotor coordination, and concentration. 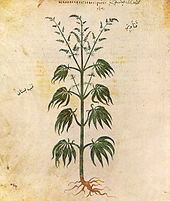 Following an 1836–1840 travel in North Africa and the Middle East, French physician Jacques-Joseph Moreau wrote on the psychological effects of cannabis use; he was a member of Paris' Club des Hashischins. [ citation needed] In 1842, Irish physician William Brooke O'Shaughnessy, who had studied the drug while working as a medical officer in Bengal with the East India company, brought a quantity of cannabis with him on his return to Britain, provoking renewed interest in the West. Examples of classic literature of the period featuring cannabis include Les paradis artificiels (1860) by Charles Baudelaire and The Hasheesh Eater (1857) by Fitz Hugh Ludlow. 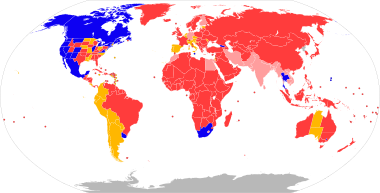 In 1925, a compromise was made at an international conference in The Hague about the International Opium Convention that banned exportation of "Indian hemp" to countries that had prohibited its use, and requiring importing countries to issue certificates approving the importation and stating that the shipment was required "exclusively for medical or scientific purposes". It also required parties to "exercise an effective control of such a nature as to prevent the illicit international traffic in Indian hemp and especially in the resin". 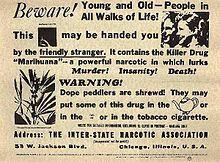 In the United States in 1937, the Marihuana Tax Act was passed,  and prohibited the production of hemp in addition to cannabis. Since the beginning of the 20th century, most countries have enacted laws against the cultivation, possession or transfer of cannabis. These laws have impacted adversely on cannabis cultivation for non-recreational purposes, but there are many regions where handling of cannabis is legal or licensed. Many jurisdictions have lessened the penalties for possession of small quantities of cannabis so that it is punished by confiscation and sometimes a fine, rather than imprisonment, focusing more on those who traffic the drug on the black market. 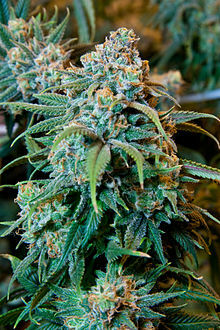 Cannabis research is challenging since the plant is illegal in most countries. Research-grade samples of the drug are difficult to obtain for research purposes, unless granted under authority of national governments. ^ Crippa JA, Zuardi AW, Martín-Santos R, Bhattacharyya S, Atakan Z, McGuire P, Fusar-Poli P (October 2009). "Cannabis and anxiety: a critical review of the evidence". Human Psychopharmacology. 24 (7): 515–23. doi: 10.1002/hup.1048. PMID 19693792. ^ Leweke FM, Mueller JK, Lange B, Rohleder C (April 2016). "Therapeutic Potential of Cannabinoids in Psychosis". Biological Psychiatry. 79 (7): 604–12. doi: 10.1016/j.biopsych.2015.11.018. PMID 26852073. ^ Ksir C, Hart CL (February 2016). "Cannabis and Psychosis: a Critical Overview of the Relationship". Current Psychiatry Reports. 18 (2): 12. doi: 10.1007/s11920-015-0657-y. PMID 26781550. ^ "Release the strains". Nature Medicine. 21 (9): 963. September 2015. doi: 10.1038/nm.3946. PMID 26340110. Retrieved 8 September 2015. ^ a b c Borgelt LM, Franson KL, Nussbaum AM, Wang GS (February 2013). "The pharmacologic and clinical effects of medical cannabis". Pharmacotherapy. 33 (2): 195–209. CiteSeerX 10.1.1.1017.1935. doi: 10.1002/phar.1187. PMID 23386598. ^ a b c d Whiting PF, Wolff RF, Deshpande S, Di Nisio M, Duffy S, Hernandez AV, Keurentjes JC, Lang S, Misso K, Ryder S, Schmidlkofer S, Westwood M, Kleijnen J (23 June 2015). "Cannabinoids for Medical Use: A Systematic Review and Meta-analysis". JAMA. 313 (24): 2456–73. doi: 10.1001/jama.2015.6358. PMID 26103030. ^ Osborne GB, Fogel C (2008). "Understanding the motivations for recreational marijuana use among adult Canadians" (PDF). Substance Use & Misuse. 43 (3–4): 539–72, discussion 573–9, 585–7. doi: 10.1080/10826080701884911. PMID 18365950. ^ Riedel G, Davies SN (2005). "Cannabinoid function in learning, memory and plasticity". Cannabinoids. Handbook of Experimental Pharmacology. 168. pp. 445–77. doi: 10.1007/3-540-26573-2_15. ISBN 978-3-540-22565-2. PMID 16596784. ^ a b Goldenberg M, IsHak WW, Danovitch I (January 2017). "Quality of life and recreational cannabis use". The American Journal on Addictions. 26 (1): 8–25. doi: 10.1111/ajad.12486. PMID 28000973. ^ Souza RS, Albuquerque UP, Monteiro JM, de Amorim EL (2008). "Brazilian Archives of Biology and Technology – Jurema-Preta (Mimosa tenuiflora [Willd.] Poir. ): a review of its traditional use, phytochemistry and pharmacology". Brazilian Archives of Biology and Technology. 51 (5): 937–947. doi: 10.1590/S1516-89132008000500010. ^ Nutt D, King LA, Saulsbury W, Blakemore C (March 2007). "Development of a rational scale to assess the harm of drugs of potential misuse". Lancet. 369 (9566): 1047–53. doi: 10.1016/s0140-6736(07)60464-4. PMID 17382831. ^ a b Hall W, Solowij N (November 1998). "Adverse effects of cannabis". Lancet. 352 (9140): 1611–6. doi: 10.1016/S0140-6736(98)05021-1. PMID 9843121. ^ Li MC, Brady JE, DiMaggio CJ, Lusardi AR, Tzong KY, Li G (4 October 2011). "Marijuana use and motor vehicle crashes". Epidemiologic Reviews. 34 (1): 65–72. doi: 10.1093/epirev/mxr017. PMC 3276316. PMID 21976636. ^ Rogeberg O, Elvik R (August 2016). "The effects of cannabis intoxication on motor vehicle collision revisited and revised". Addiction. 111 (8): 1348–59. doi: 10.1111/add.13347. PMID 26878835. ^ Gordon AJ, Conley JW, Gordon JM (December 2013). "Medical consequences of marijuana use: a review of current literature". Current Psychiatry Reports. 15 (12): 419. doi: 10.1007/s11920-013-0419-7. PMID 24234874. ^ Gunn JK, Rosales CB, Center KE, Nuñez A, Gibson SJ, Christ C, Ehiri JE (April 2016). "Prenatal exposure to cannabis and maternal and child health outcomes: a systematic review and meta-analysis". BMJ Open. 6 (4): e009986. doi: 10.1136/bmjopen-2015-009986. PMC 4823436. PMID 27048634. ^ Conner SN, Bedell V, Lipsey K, Macones GA, Cahill AG, Tuuli MG (October 2016). "Maternal Marijuana Use and Adverse Neonatal Outcomes: A Systematic Review and Meta-analysis". Obstetrics and Gynecology. 128 (4): 713–23. doi: 10.1097/AOG.0000000000001649. PMID 27607879. ^ Subbaraman MS (8 January 2014). "Can cannabis be considered a substitute medication for alcohol?". Alcohol and Alcoholism. 49 (3): 292–8. doi: 10.1093/alcalc/agt182. PMC 3992908. PMID 24402247. ^ Owen KP, Sutter ME, Albertson TE (February 2014). "Marijuana: respiratory tract effects". Clinical Reviews in Allergy & Immunology. 46 (1): 65–81. doi: 10.1007/s12016-013-8374-y. PMID 23715638. ^ Tetrault JM, Crothers K, Moore BA, Mehra R, Concato J, Fiellin DA (February 2007). "Effects of marijuana smoking on pulmonary function and respiratory complications: a systematic review". Archives of Internal Medicine. 167 (3): 221–8. doi: 10.1001/archinte.167.3.221. PMC 2720277. PMID 17296876. ^ Sorensen CJ, DeSanto K, Borgelt L, Phillips KT, Monte AA (March 2017). "Cannabinoid Hyperemesis Syndrome: Diagnosis, Pathophysiology, and Treatment-a Systematic Review". Journal of Medical Toxicology. 13 (1): 71–87. doi: 10.1007/s13181-016-0595-z. PMC 5330965. PMID 28000146. ^ Gates P, Jaffe A, Copeland J (July 2014). "Cannabis smoking and respiratory health: consideration of the literature". Respirology. 19 (5): 655–62. doi: 10.1111/resp.12298. PMID 24831571. ^ Huang YH, Zhang ZF, Tashkin DP, Feng B, Straif K, Hashibe M (January 2015). "An epidemiologic review of marijuana and cancer: an update". Cancer Epidemiology, Biomarkers & Prevention. 24 (1): 15–31. doi: 10.1158/1055-9965.EPI-14-1026. PMC 4302404. PMID 25587109. ^ Tashkin DP (June 2013). "Effects of marijuana smoking on the lung". Annals of the American Thoracic Society. 10 (3): 239–47. doi: 10.1513/annalsats.201212-127fr. PMID 23802821. ^ Gurney J, Shaw C, Stanley J, Signal V, Sarfati D (November 2015). "Cannabis exposure and risk of testicular cancer: a systematic review and meta-analysis". BMC Cancer. 15 (1): 897. doi: 10.1186/s12885-015-1905-6. PMC 4642772. PMID 26560314. ^ Zhang LR, Morgenstern H, Greenland S, Chang SC, Lazarus P, Teare MD, Woll PJ, Orlow I, Cox B, Brhane Y, Liu G, Hung RJ (February 2015). "Cannabis smoking and lung cancer risk: Pooled analysis in the International Lung Cancer Consortium". International Journal of Cancer. 136 (4): 894–903. doi: 10.1002/ijc.29036. PMC 4262725. PMID 24947688. ^ de Carvalho MF, Dourado MR, Fernandes IB, Araújo CT, Mesquita AT, Ramos-Jorge ML (December 2015). "Head and neck cancer among marijuana users: a meta-analysis of matched case-control studies". Archives of Oral Biology. 60 (12): 1750–5. doi: 10.1016/j.archoralbio.2015.09.009. PMID 26433192. ^ Ravi D, Ghasemiesfe M, Korenstein D, Cascino T, Keyhani S (February 2018). "Associations Between Marijuana Use and Cardiovascular Risk Factors and Outcomes: A Systematic Review". Annals of Internal Medicine. 168 (3): 187–194. doi: 10.7326/M17-1548. PMC 6157910. PMID 29357394. ^ Piano MR (August 2017). "Cannabis Smoking and Cardiovascular Health: It's Complicated". Clinical Pharmacology and Therapeutics. 102 (2): 191–193. doi: 10.1002/cpt.721. PMID 28548223. ^ Hackam DG (March 2015). "Cannabis and stroke: systematic appraisal of case reports". Stroke. 46 (3): 852–6. doi: 10.1161/STROKEAHA.115.008680. PMID 25700287. ^ Jones RT (November 2002). 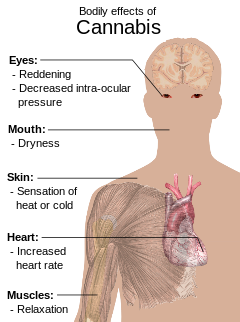 "Cardiovascular system effects of marijuana". Journal of Clinical Pharmacology (Review). 42 (S1): 58S–63S. Bibcode: 1991JClP...31..928S. doi: 10.1002/j.1552-4604.2002.tb06004.x. PMID 12412837. ^ Singh A, Saluja S, Kumar A, Agrawal S, Thind M, Nanda S, Shirani J (June 2018). "Cardiovascular Complications of Marijuana and Related Substances: A Review". Cardiology and Therapy. 7 (1): 45–59. doi: 10.1007/s40119-017-0102-x. PMC 5986667. PMID 29218644. ^ Franz CA, Frishman WH (9 February 2016). "Marijuana Use and Cardiovascular Disease". Cardiology in Review. 24 (4): 158–62. doi: 10.1097/CRD.0000000000000103. PMID 26886465. ^ Rocchetti M, Crescini A, Borgwardt S, Caverzasi E, Politi P, Atakan Z, Fusar-Poli P (November 2013). "Is cannabis neurotoxic for the healthy brain? A meta-analytical review of structural brain alterations in non-psychotic users". Psychiatry and Clinical Neurosciences. 67 (7): 483–92. doi: 10.1111/pcn.12085. PMID 24118193. ^ a b Batalla A, Bhattacharyya S, Yücel M, Fusar-Poli P, Crippa JA, Nogué S, Torrens M, Pujol J, Farré M, Martin-Santos R (2013). "Structural and functional imaging studies in chronic cannabis users: a systematic review of adolescent and adult findings". PLOS One. 8 (2): e55821. Bibcode: 2013PLoSO...855821B. doi: 10.1371/journal.pone.0055821. PMC 3563634. PMID 23390554. The most consistently reported brain alteration was reduced hippocampal volume which was shown to persist even after several months of abstinence in one study and also to be related to the amount of cannabis use Other frequently reported morphological brain alterations related to chronic cannabis use were reported in the amygdala the cerebellum and the frontal cortex...These findings may be interpreted as reflecting neuroadaptation, perhaps indicating the recruitment of additional regions as a compensatory mechanism to maintain normal cognitive performance in response to chronic cannabis exposure, particularly within the prefrontal cortex area. ^ a b Weinstein A, Livny A, Weizman A (2016). "Brain Imaging Studies on the Cognitive, Pharmacological and Neurobiological Effects of Cannabis in Humans: Evidence from Studies of Adult Users". Current Pharmaceutical Design. 22 (42): 6366–6379. doi: 10.2174/1381612822666160822151323. PMID 27549374. 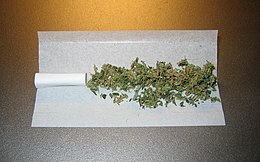 1)The studies reviewed so far demonstrated that chronic cannabis use has been associated with a volume reduction of the hippocampus...3)The overall conclusion arising from these studies is that recent cannabis users may experience subtle neurophysiological deficits while performing on working memory tasks, and that they compensate for these deficits by "working harder" by using additional brain regions to meet the demands of the task. ^ Lorenzetti V, Solowij N, Yücel M (April 2016). "The Role of Cannabinoids in Neuroanatomic Alterations in Cannabis Users". Biological Psychiatry. 79 (7): e17–31. doi: 10.1016/j.biopsych.2015.11.013. PMID 26858212. ^ Blest-Hopley G, Giampietro V, Bhattacharyya S (May 2018). "Residual effects of cannabis use in adolescent and adult brains - A meta-analysis of fMRI studies". Neuroscience and Biobehavioral Reviews. 88: 26–41. doi: 10.1016/j.neubiorev.2018.03.008. PMID 29535069. This may reflect the multitude of cognitive tasks employed by the various studies included in these meta-analyses, all of which involved performing a task thereby requiring the participant to reorient their attention and attempt to solve the problem at hand and suggest that greater engagement of this region indicates less efficient cognitive performance in cannabis users in general, irrespective of their age. ^ a b c d Curran HV, Freeman TP, Mokrysz C, Lewis DA, Morgan CJ, Parsons LH (May 2016). "Keep off the grass? Cannabis, cognition and addiction" (PDF). Nature Reviews. Neuroscience. 17 (5): 293–306. doi: 10.1038/nrn.2016.28. PMID 27052382. ^ Parsons LH, Hurd YL (October 2015). "Endocannabinoid signalling in reward and addiction". Nature Reviews. Neuroscience. 16 (10): 579–94. doi: 10.1038/nrn4004. PMC 4652927. PMID 26373473. ^ Zehra A, Burns J, Liu CK, Manza P, Wiers CE, Volkow ND, Wang GJ (March 2018). "Cannabis Addiction and the Brain: a Review". Journal of Neuroimmune Pharmacology. 13 (4): 438–452. doi: 10.1007/s11481-018-9782-9. PMC 6223748. PMID 29556883. ^ Colizzi M, McGuire P, Pertwee RG, Bhattacharyya S (May 2016). "Effect of cannabis on glutamate signalling in the brain: A systematic review of human and animal evidence". Neuroscience and Biobehavioral Reviews. 64: 359–81. doi: 10.1016/j.neubiorev.2016.03.010. PMID 26987641. ^ Schoeler T, Kambeitz J, Behlke I, Murray R, Bhattacharyya S (January 2016). "The effects of cannabis on memory function in users with and without a psychotic disorder: findings from a combined meta-analysis". Psychological Medicine. 46 (1): 177–88. doi: 10.1017/S0033291715001646. PMID 26353818. ^ a b Schreiner AM, Dunn ME (October 2012). "Residual effects of cannabis use on neurocognitive performance after prolonged abstinence: a meta-analysis". Experimental and Clinical Psychopharmacology. 20 (5): 420–429. doi: 10.1037/a0029117. PMID 22731735. Therefore, results indicate evidence for small neurocognitive effects that persist after the period of acute intoxication...As hypothesized, the meta-analysis conducted on studies eval- uating users after at least 25 days of abstention found no residual effects on cognitive performance...These results fail to support the idea that heavy cannabis use may result in long-term, persistent effects on neuropsychological functioning. ^ Gonzalez R, Carey C, Grant I (November 2002). "Nonacute (residual) neuropsychological effects of cannabis use: a qualitative analysis and systematic review". Journal of Clinical Pharmacology. 42 (S1): 48S–57S. doi: 10.1002/j.1552-4604.2002.tb06003.x. PMID 12412836. ^ Crean RD, Crane NA, Mason BJ (March 2011). "An evidence based review of acute and long-term effects of cannabis use on executive cognitive functions". Journal of Addiction Medicine. 5 (1): 1–8. doi: 10.1097/ADM.0b013e31820c23fa. PMC 3037578. PMID 21321675. Cannabis appears to continue to exert impairing effects in executive functions even after 3 weeks of abstinence and beyond. While basic attentional and working memory abilities are largely restored, the most enduring and detectable deficits are seen in decision-making, concept formation and planning. ^ Broyd SJ, van Hell HH, Beale C, Yücel M, Solowij N (April 2016). "Acute and Chronic Effects of Cannabinoids on Human Cognition-A Systematic Review". Biological Psychiatry. 79 (7): 557–67. doi: 10.1016/j.biopsych.2015.12.002. PMID 26858214. ^ Ganzer F, Bröning S, Kraft S, Sack PM, Thomasius R (June 2016). "Weighing the Evidence: A Systematic Review on Long-Term Neurocognitive Effects of Cannabis Use in Abstinent Adolescents and Adults". Neuropsychology Review. 26 (2): 186–222. doi: 10.1007/s11065-016-9316-2. PMID 27125202. ^ Marconi A, Di Forti M, Lewis CM, Murray RM, Vassos E (September 2016). 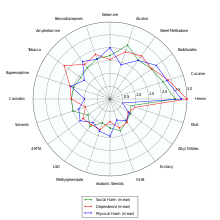 "Meta-analysis of the Association Between the Level of Cannabis Use and Risk of Psychosis". Schizophrenia Bulletin. 42 (5): 1262–9. doi: 10.1093/schbul/sbw003. PMC 4988731. PMID 26884547. ^ a b Moore TH, Zammit S, Lingford-Hughes A, Barnes TR, Jones PB, Burke M, Lewis G (July 2007). "Cannabis use and risk of psychotic or affective mental health outcomes: a systematic review" (PDF). Lancet. 370 (9584): 319–28. doi: 10.1016/S0140-6736(07)61162-3. PMID 17662880. ^ a b Calabria B, Degenhardt L, Hall W, Lynskey M (May 2010). "Does cannabis use increase the risk of death? Systematic review of epidemiological evidence on adverse effects of cannabis use". Drug and Alcohol Review. 29 (3): 318–30. doi: 10.1111/j.1465-3362.2009.00149.x. PMID 20565525. ^ Borges G, Bagge CL, Orozco R (May 2016). "A literature review and meta-analyses of cannabis use and suicidality". Journal of Affective Disorders. 195: 63–74. doi: 10.1016/j.jad.2016.02.007. PMID 26872332. ^ Lev-Ran S, Roerecke M, Le Foll B, George TP, McKenzie K, Rehm J (March 2014). "The association between cannabis use and depression: a systematic review and meta-analysis of longitudinal studies". Psychological Medicine. 44 (4): 797–810. doi: 10.1017/S0033291713001438. PMID 23795762. ^ Kedzior KK, Laeber LT (May 2014). "A positive association between anxiety disorders and cannabis use or cannabis use disorders in the general population--a meta-analysis of 31 studies". BMC Psychiatry. 14: 136. doi: 10.1186/1471-244X-14-136. PMC 4032500. PMID 24884989. ^ Gobbi, Gabriella; Atkin, Tobias; Zytynski, Tomasz; Wang, Shouao; Askari, Sorayya; Boruff, Jill; Ware, Mark; Marmorstein, Naomi; Cipriani, Andrea; Dendukuri, Nandini; Mayo, Nancy (13 February 2019). "Cannabis Use in Adolescence and Risk of Depression, Anxiety, and Suicidality in Young Adulthood". JAMA Psychiatry. doi: 10.1001/jamapsychiatry.2018.4500. PMID 30758486. Retrieved 13 February 2019. ^ Subbaraman MS (2014). "Can cannabis be considered a substitute medication for alcohol?". Alcohol and Alcoholism. 49 (3): 292–8. doi: 10.1093/alcalc/agt182. PMC 3992908. PMID 24402247. ^ Wilson RI, Nicoll RA (April 2002). "Endocannabinoid signaling in the brain". Science. 296 (5568): 678–82. Bibcode: 2002Sci...296..678W. doi: 10.1126/science.1063545. PMID 11976437. ^ Oleson EB, Cheer JF (August 2012). "A brain on cannabinoids: the role of dopamine release in reward seeking". Cold Spring Harbor Perspectives in Medicine. 2 (8): a012229. doi: 10.1101/cshperspect.a012229. PMC 3405830. PMID 22908200. ^ Kathmann M, Flau K, Redmer A, Tränkle C, Schlicker E (February 2006). "Cannabidiol is an allosteric modulator at mu- and delta-opioid receptors". Naunyn-Schmiedeberg's Archives of Pharmacology. 372 (5): 354–61. doi: 10.1007/s00210-006-0033-x. PMID 16489449. ^ Hejazi N, Zhou C, Oz M, Sun H, Ye JH, Zhang L (March 2006). "Delta9-tetrahydrocannabinol and endogenous cannabinoid anandamide directly potentiate the function of glycine receptors" (PDF). Molecular Pharmacology. 69 (3): 991–7. doi: 10.1124/mol.105.019174. PMID 16332990. ^ Xiong W, Cheng K, Cui T, Godlewski G, Rice KC, Xu Y, Zhang L (May 2011). "Cannabinoid potentiation of glycine receptors contributes to cannabis-induced analgesia". Nature Chemical Biology. 7 (5): 296–303. doi: 10.1038/nchembio.552. PMC 3388539. PMID 21460829. ^ Venkatratnam A, Lents NH (July 2011). "Zinc reduces the detection of cocaine, methamphetamine, and THC by ELISA urine testing". Journal of Analytical Toxicology. 35 (6): 333–40. doi: 10.1093/anatox/35.6.333. PMID 21740689. ^ Lin CN, Strathmann FG (July 10, 2013). "Elevated urine zinc concentration reduces the detection of methamphetamine, cocaine, THC and opiates in urine by EMIT" (PDF). Journal of Analytical Toxicology. 37 (9): 665–9. doi: 10.1093/jat/bkt056. PMID 23843421. ^ Piomelli D, Russo EB (2016). 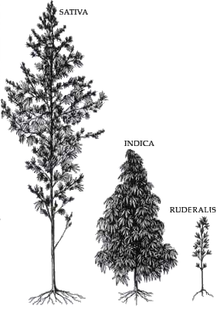 "The Cannabis sativa Versus Cannabis indica Debate: An Interview with Ethan Russo, MD". Cannabis and Cannabinoid Research. 1 (1): 44–46. doi: 10.1089/can.2015.29003.ebr. PMC 5576603. PMID 28861479. ^ Cascini F, Aiello C, Di Tanna G (March 2012). "Increasing delta-9-tetrahydrocannabinol (Δ-9-THC) content in herbal cannabis over time: systematic review and meta-analysis". Current Drug Abuse Reviews. 5 (1): 32–40. doi: 10.2174/1874473711205010032. PMID 22150622. ^ Di Forti M, Morgan C, Dazzan P, Pariante C, Mondelli V, Marques TR, Handley R, Luzi S, et al. (December 2009). "High-potency cannabis and the risk of psychosis". The British Journal of Psychiatry. 195 (6): 488–91. doi: 10.1192/bjp.bp.109.064220. PMC 2801827. PMID 19949195. ^ a b Joshua CD (2015). "The business of getting high: head shops, countercultural capitalism, and the marijuana legalization movement". The Sixties. 8: 27–49. doi: 10.1080/17541328.2015.1058480. ^ Degenhardt L, Coffey C, Carlin JB, Moran P, Patton GC (August 2007). "Who are the new amphetamine users? A 10-year prospective study of young Australians". Addiction. 102 (8): 1269–79. doi: 10.1111/j.1360-0443.2007.01906.x. PMID 17624977. ^ Morral AR, McCaffrey DF, Paddock SM (December 2002). "Reassessing the marijuana gateway effect". Addiction. 97 (12): 1493–504. doi: 10.1046/j.1360-0443.2002.00280.x. PMID 12472629. ^ Torabi MR, Bailey WJ, Majd-Jabbari M (September 1993). "Cigarette smoking as a predictor of alcohol and other drug use by children and adolescents: evidence of the "gateway drug effect"". The Journal of School Health. 63 (7): 302–6. doi: 10.1111/j.1746-1561.1993.tb06150.x. PMID 8246462. ^ Vanyukov MM, Tarter RE, Kirillova GP, Kirisci L, Reynolds MD, Kreek MJ, Conway KP, Maher BS, Iacono WG, Bierut L, Neale MC, Clark DB, Ridenour TA (June 2012). "Common liability to addiction and "gateway hypothesis": theoretical, empirical and evolutionary perspective". Drug and Alcohol Dependence (Review). 123 Suppl 1: S3–17. doi: 10.1016/j.drugalcdep.2011.12.018. PMC 3600369. PMID 22261179. ^ Ponto LL (May 2006). "Challenges of marijuana research". Brain. 129 (Pt 5): 1081–3. doi: 10.1093/brain/awl092. PMID 16627464. ^ Peters EN, Budney AJ, Carroll KM (August 2012). "Clinical correlates of co-occurring cannabis and tobacco use: a systematic review". Addiction. 107 (8): 1404–17. doi: 10.1111/j.1360-0443.2012.03843.x. PMC 3377777. PMID 22340422. ^ Iseger TA, Bossong MG (March 2015). "A systematic review of the antipsychotic properties of cannabidiol in humans". Schizophrenia Research. 162 (1–3): 153–61. doi: 10.1016/j.schres.2015.01.033. PMID 25667194. ^ McLoughlin BC, Pushpa-Rajah JA, Gillies D, Rathbone J, Variend H, Kalakouti E, Kyprianou K (October 2014). "Cannabis and schizophrenia". The Cochrane Database of Systematic Reviews. 10 (10): CD004837. doi: 10.1002/14651858.CD004837.pub3. PMC 4332954. PMID 25314586. ^ Morales P, Hurst DP, Reggio PH (2017). Kinghorn AD, Falk H, Gibbons S, Kobayashi J (eds.). Molecular Targets of the Phytocannabinoids: A Complex Picture. Progress in the Chemistry of Organic Natural Products. 103. Springer International Publishing. pp. 103–131. doi: 10.1007/978-3-319-45541-9_4. ISBN 978-3-319-45539-6. PMC 5345356. PMID 28120232. ^ Felson, Jacob; Adamczyk, Amy; Thomas, Christopher (2018). "How and why have attitudes about cannabis legalization changed so much?" (PDF). Social Science Research. 78: 12–27. doi: 10.1016/j.ssresearch.2018.12.011. PMID 30670211. Retrieved 2019-01-03.